Hello! I hope you're having a great week! I'm so glad that tomorrow is Friday... I have a simple card to show you using the Bake Me a Cake dies. This die set is super fun - it can be used on a card front (like I have done today) or even made into mini cake shaped cards. Instead of making my cake really fancy (with the exception of a few pearls), I went a little rustic and made a cake with a Kraft base and added a few colors to match my patterned paper background. 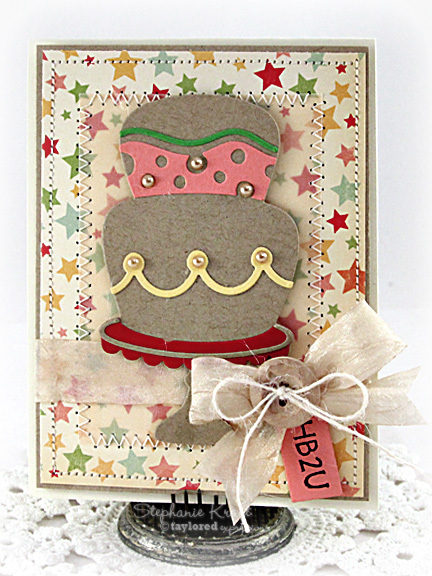 The sentiment HB2U (Happy Birthday to You) is from You Take the Cake and stamped onto a mini tag. One more thing before I go... there is still a bit of time to enter the first round of Taylored Expressions Last Card Standing! Deadline for submissions for the Open Casting Round is tonight by 11:59 PM PST. For contest details, visit the Taylored Expressions Member Company Forum at Splitcoaststampers. Good luck! Cute card Stephanie! Love the little sentiment tag and fun cake!